Any jewelry is beautiful and sparkly when it’s new. However, dust, lotion, dirt, and other elements can cause your jewelry to lose that usual shine over time. However, don’t worry; there are various ways of cleaning your jewelry, even without the help of professionals. There are helpful hacks you can do yourself. Here are five simple tips to clean your jewelry. Make a paste that contains a ¼ cup of baking soda and 2 tablespoons of water. Dampen a soft, lint-free cloth and gently rub the paste on your jewelry. Work the mixture into crevices, too. 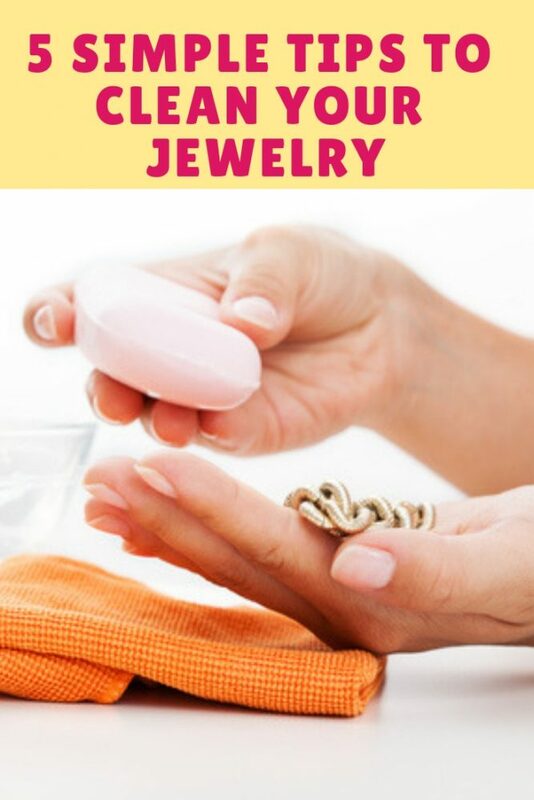 Rinse the jewelry in warm water and buff it dry. Don’t rub silver-plated jewelry too hard or too much so the finish won’t wear off. You can cover gold jewelry with a light coating of baking soda, pour a small amount of vinegar, and then rinse it to polish. Do not use this paste on pieces with gemstones and pearls because it could loosen the adhesive or damage the finish. Mix 2 cups of warm water and a couple of drops of mild dish soap or laundry detergent. Place your jewelry in the mixture and soak it for 10–15 minutes. Use a soft toothbrush or cloth to scrub away the dirt, rinse the pieces, and wipe it dry with a soft cloth. Avoid soaking your jewelry in the solution for too long as cleaning agents present in the soap may damage it. Don’t use strong detergents, rough cloth, or hard toothbrush. Allow your jewelry to completely dry before storage. This method can be used on soft stones such as pearls and turquoise. However, instead of soaking them, lay them on a soft cloth and use a clean makeup brush to dip into the mixture and go over the pieces. Finish by wiping them with a soft, damp cloth. Line a bowl with aluminum foil and fill it with hot water. Mix 1tablespoon of bleach-free powdered detergent or baking soda. Soak your jewelry in the mixture for 1–3 minutes, rinse it thoroughly with warm water, and wipe it dry with a lint-free cloth. Drop a tablet or two in a glass of warm water and add your jewelry in. Let your jewelry sit in it for a few minutes until the mixture stops fizzling. Remove your jewelry, rinse it, and wipe it dry with a soft cloth. This mixture can be used with hard stones such as diamonds, silver, and gold. Don’t use flavored antacids or Alka-Seltzer because the dye may affect your jewelry’s color. 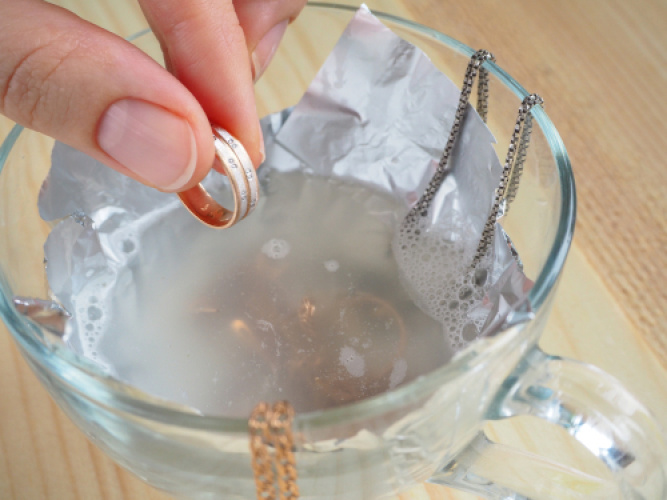 Pour beer in a bowl and soak your solid gold jewelry in it for 5–10 minutes. Remove the jewelry and dry it with a smooth cloth. Don’t clean gold jewelry with gemstones using this mixture. If you do try this with silver jewelry, it’s highly possible that it can clean the silver and make the shade lighter but not as good as using aluminum foil for it. Taking care of your valuables shouldn’t be difficult considering that there are ways to clean jewelry without professional help. The tips we’ve provided above are so simple that you can find the cleaning items in the comfort of your home. Don’t forget to clean your jewelry regularly so that they continue to have the shine to always look new.